I only recently came into contact with Brooklyn, a micro-brewery that has been making craft beer since the late 80’s. Having sampled their lager at a local eatery here in Victoria, I found that I was quite pleased. And after some research, I learned that they’ve earned a few awards for their products over the years. So when my bro-in-law got me some for Christmas (hi Isaac! ), I was pretty pleased. On the one hand, the use of dark malts give it a bitter, chocolatey flavor. On the other, the fact that it is an especially strong beer (10 % alc/vol) lends it the strong, sweet taste of a barley wine. An interesting combination if ever there was one, but the taste, smell and deleterious effects were nothing short of welcome. 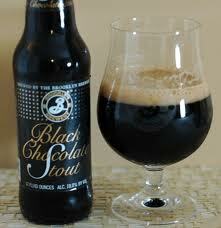 And as a fan of both chocolate stouts and barley wines, I could appreciate the combination. This entry was posted in Beer, Reviews and tagged beer review, black chocolate stout, brooklyn black chocolate stout, brooklyn brewery, catherine the great, imperial stout, seasonal beer by storiesbywilliams. Bookmark the permalink.